Just because you have made the health conscious choice to cut gluten out of your diet doesn’t mean you can’t eat great party food with your friends. With the Super Bowl right around the corner, now is the perfect time to “rush” your party hosting skills with some delicious fare fit for a crowd. Here is a fun selection of gluten-free football party foods that are both festive and delicious, and also healthy. Everyone loves buffalo wings and they are a football party staple. However, they aren’t exactly good for you. The gluten free football party version of buffalo wings is light, bright buffalo cauliflower bites. 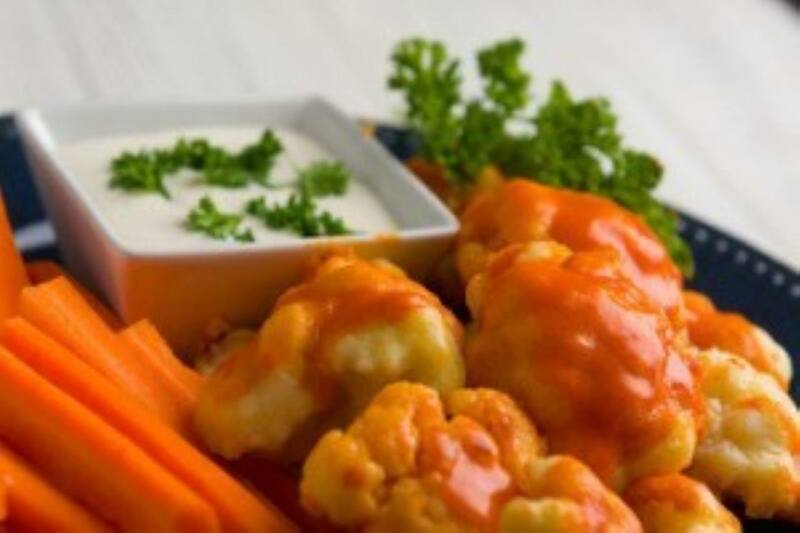 Simply toss fresh cauliflower with your favorite hot-wing sauce and roast it in the oven for 30 minutes. Add freshly sliced celery and carrots for a more buffalo “wing” experience. Don’t the forget blue cheese (or ranch) for dipping! Stir reduced-fat cream cheese together with Greek yogurt with finely chopped fresh thyme, and finish it off with pieces of bacon, mushrooms, and sliced scallions. This party-worthy dip is both calorie conscious and crave-able. It’s also packed with 7 grams of protein per serving. Of course, you can’t have a gluten-free football party without including some tasty Snackers! Our Real Cheddar Snackers are a crowd favorite, and lower in fat, calories, and salt than mainstream counterparts. Arrange walnuts on a lined baking sheet. Toast for about 10 minutes, or until golden and fragrant. Meanwhile, wipe dirt off mushrooms with a damp cloth. Carefully remove the stems. Transfer walnuts into a large food processor. Place mushrooms hole side up on the baking sheet and bake for 15 minutes. Meanwhile, pulse walnuts until finely chopped. Add basil, spinach, garlic, lemon juice, and salt. Pulse until well combined. Use a spatula to scrap down the sides. Add hummus and blend until fully combined. Spoon mixture evenly into center of mushrooms. Arrange mushrooms on baking sheet and bake for 10 minutes. 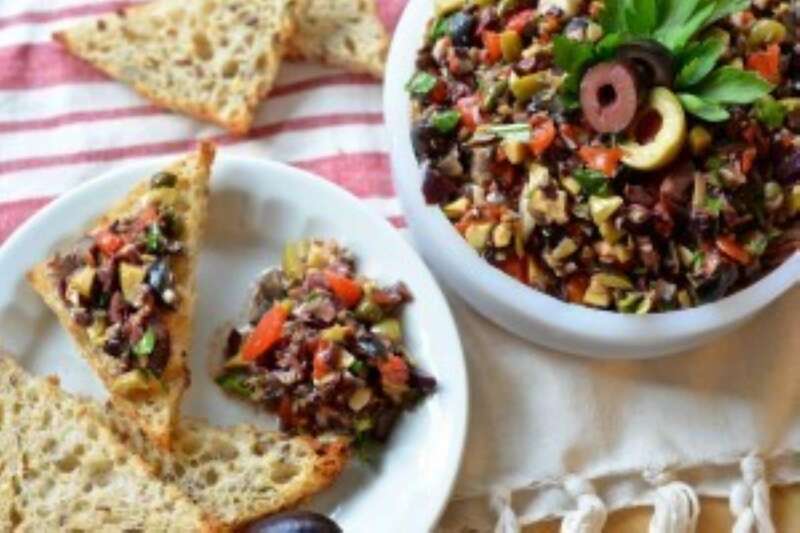 We recently featured this Three Olive Tapenade (served with Three Bakers toast points) and it has been one of our most shared recipes. Combine kalamata, green and black olives with bell pepper, capers, fresh herbs and lemon juice in a food processor. Serve with toasted triangles. The tapenade can be made up to two days in advance. Serve at room temperature. Get the entire recipe here. There are few combinations that go together as well as cold days, football watching and chili eating. 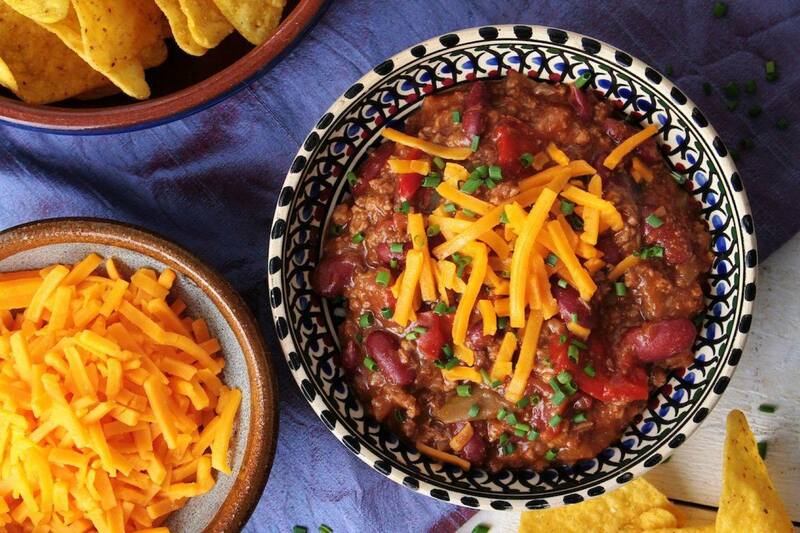 Chili Con Carne is a delicious gluten free option to feed a crowd. Brown meat of your choice with onion and garlic, then add to a crockpot with tomatoes, kidney beans, spices and a chicken stock. Serve with shredded cheese and corn chips. Easy. Delicious. Entertaining for a football party doesn’t have to be stressful just because you, or your guests, may be gluten-free! 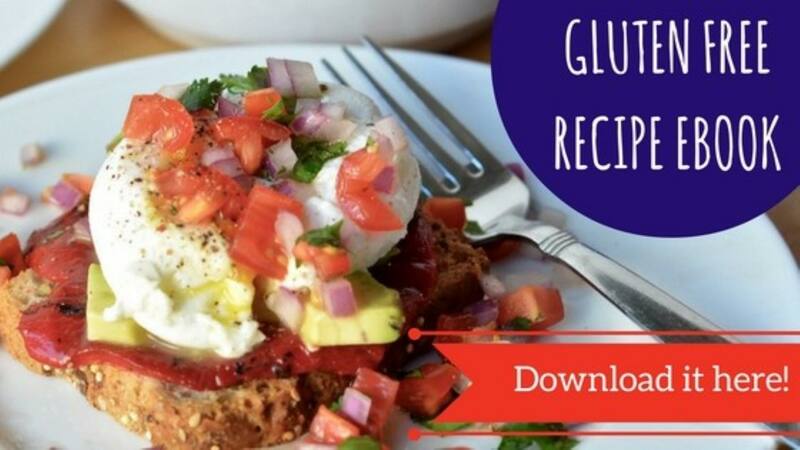 Find more great recipes from our food blogger, Angela Lintzinger, here.